A small elevated house on an idyllic plantation in the mild and hospitable clime of Khenarthi's Roost? This one would find that sweet paradise! 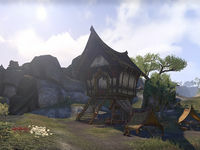 Moonmirth House is a small player house in Laughing Moons Plantation. The house has one large room. 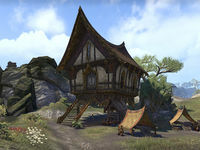 To purchase this house with Gold, you need to complete the Maormer's Bane achievement and Room to Spare. This house replaced a storage hut, which contained a few crates, in Update 12.